I'm not entirely sure of the consequences of this workaround, but one thing I've noticed is significantly reduced battery life. I'll attach screenshots of various times I've encountered this bug over the last year. Please try latest mainline kernel  without "noapic" parameter. 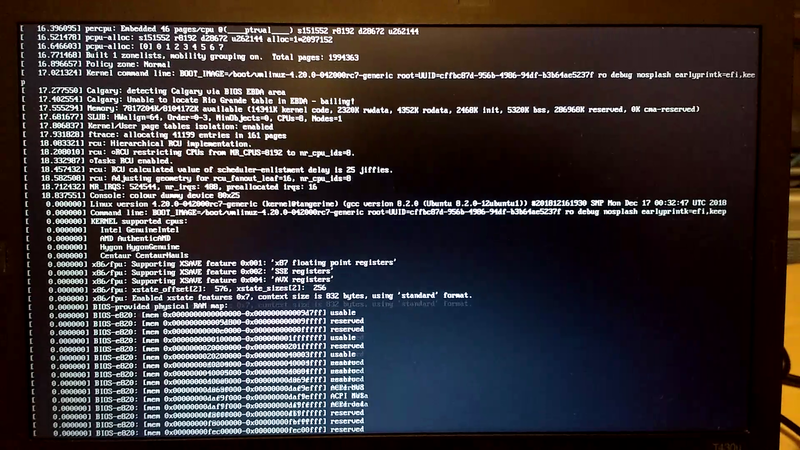 I just tried kernel v4.20-rc7 and without noapic my computer hangs at a blank screen. With noapic it boots fine. The next step is to find the last working -rc kernel and first non-working -rc kernel. From your description, both of them should be <= v4.13. The kernels can be found in . I'm still using v4.20-rc7, and I wanted to try some more kernel parameters to narrow down the problem. 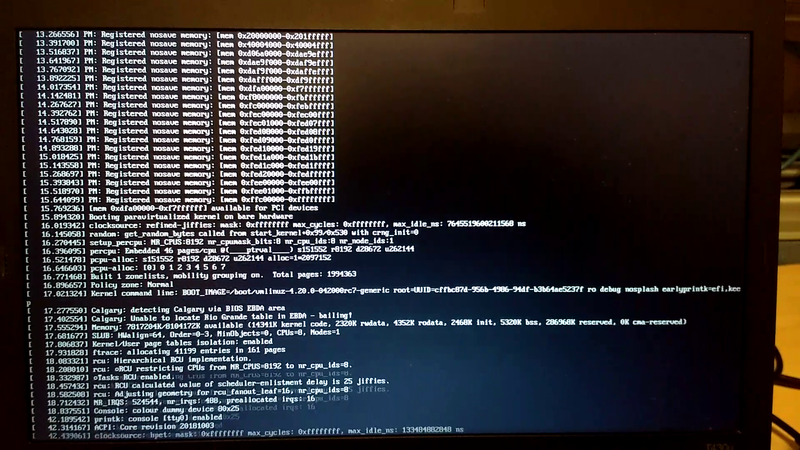 Since the last kernel messages I got using earlyprintk (https://gist.githubusercontent.com/bmaupin/b743bb3325e100341c62ee62e713d8a4/raw/7372dddb5704d3f15ff429807355d5d3686165d2/boot7.png) were related to the Spectre mitigations, I removed noapic and replaced it with spec_store_bypass_disable=off and it booted. Oddly enough then I removed spec_store_bypass_disable=off altogether and it booted without any special parameters. So I don't fully understand what happened, but it seems like my system boots fine now without any special parameters. I'll remove v4.20-rc next and see if it still boots with the kernels from Bionic. 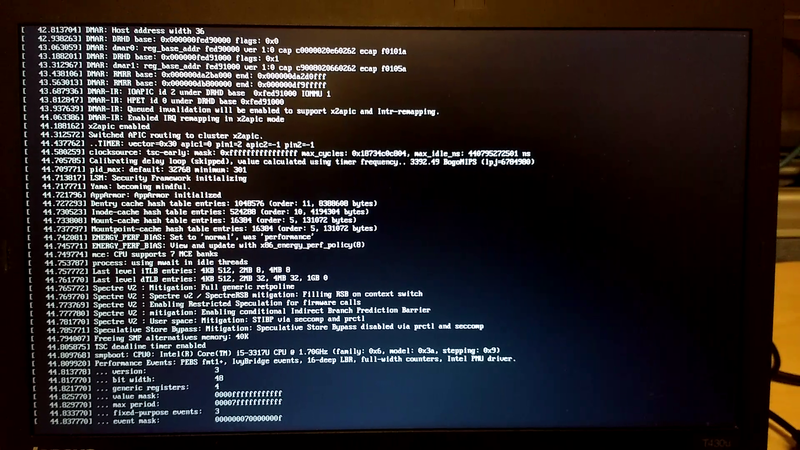 I tried to boot with an older kernel (4.15.0-43), and it wouldn't boot without noapic. But v4.20-rc7 seems to boot fine. 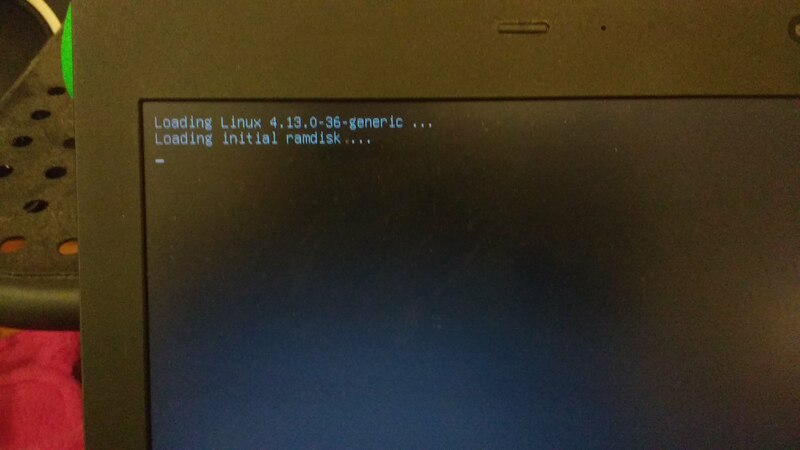 I guess it must've been a fluke that it didn't boot for me the first time. 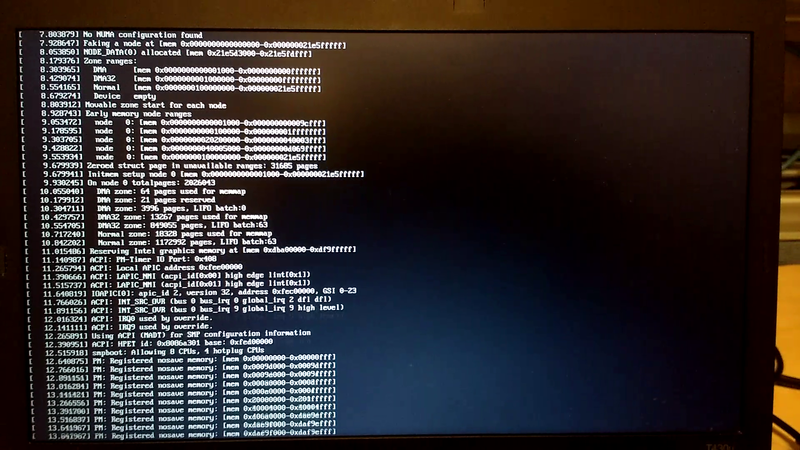 Should I still try to figure out which RC kernel the problem started? Maybe you can try adding 'apic=debug' and remove 'quiet splash' parameters when you boot and see if kernel shows more messages that can point to the problem. I'm assuming I should add apic=debug to a kernel that has the bug (and not one that boots fine), correct? Should I used apic=debug with or without noapic? I haven't reformatted my machine in years and was running into some other issues, so I just did a reinstall of 18.04. With both the install media and the latest 18.04 kernel (4.15.something), I needed noapic. 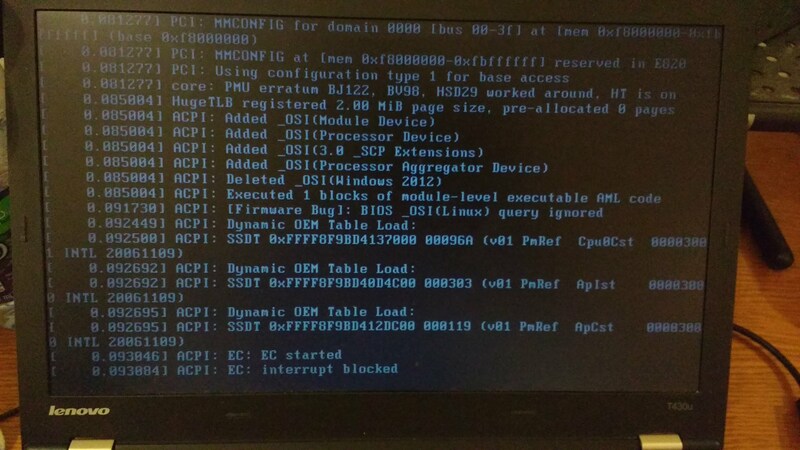 So I installed kernel v4.20.4-042004, and it would not boot without noapic either. 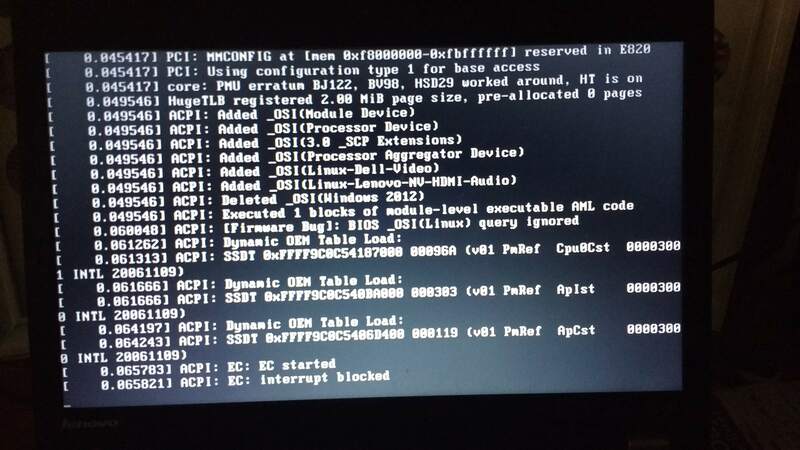 However, after I boot to v4.20 with noapic one time, I can remove it and it seems to boot fine. So the issue persists with the latest kernels albeit slightly differently. When I get a chance I'll try to figure out which kernel the problem started since apparently the problem hasn't yet been resolved. I tested a few kernels, and v4.12.14 is the last kernel that works without noapic. Starting with v4.13-rc1 my computer will hang on boot unless I use noapic. The commit is not correct. When doing a bisection, please skip stable release, (e.g. 4.12.1), and use mainline release (e.g. 4.12). I followed your instructions exactly as written. How can I use the mainline release? This is really weird. I don't think you system has "ccree" device which only presents on ARM devices. It looks to me like there are a lot more than just ARM changes there, but I don't know anything about kernel development so I might not be . I'm surprised to see so many changes committed all at once. Is there any way to narrow down which change is causing the regression? ... but I'm honestly not sure if any of that was related or just a timing coincidence. We want the IIO fixes and other staging driver fixes in here as well. So probably a good idea to bisect between e5770b7bdbfe and 32c1431eea48. 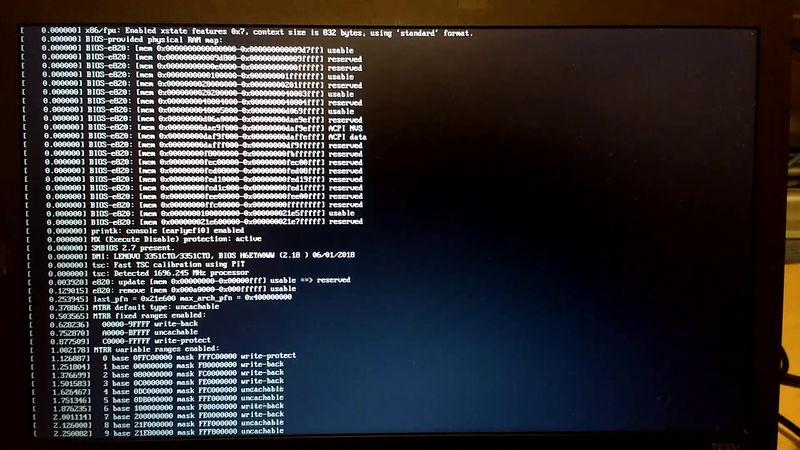 - First, try latest mainline kernel (v5.0) again, hopefully there's a fix already. - Does the issue happen 100% of the time? Otherwise the bisection can be inconclusive. - Or, take a look kernel config on v4.12 and v4.13-rc1 - maybe some new option breaks your system. 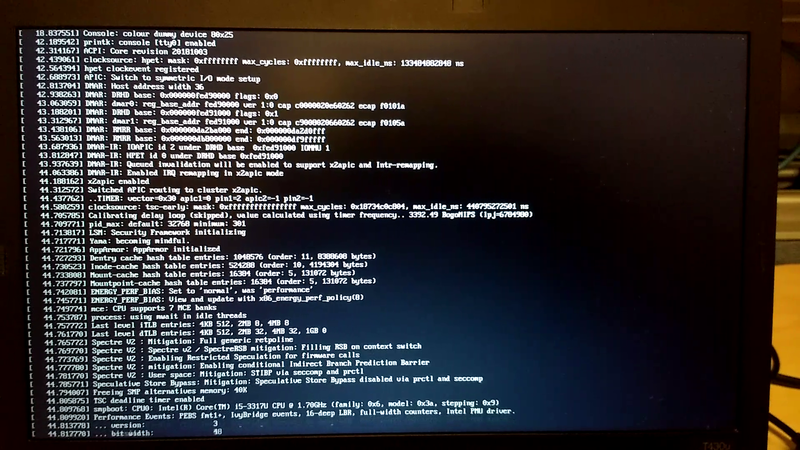 > - First, try latest mainline kernel (v5.0) again, hopefully there's a fix already. 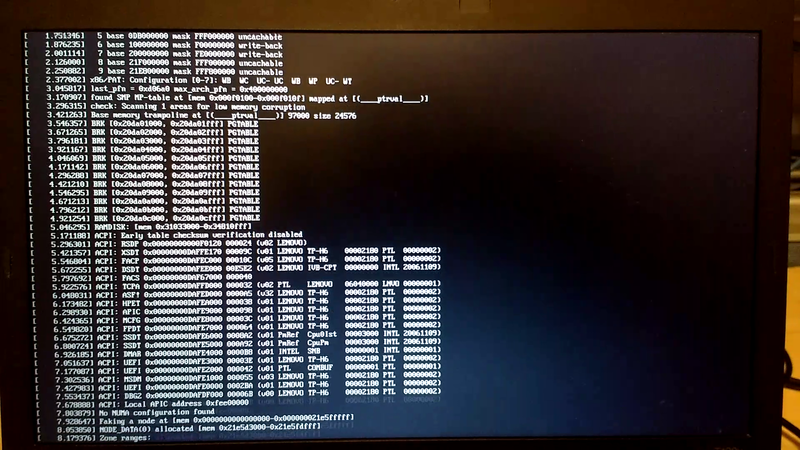 No, it looks like it still won't boot (without noapic). > - Does the issue happen 100% of the time? Otherwise the bisection can be inconclusive. Yes, it happens 100% of the time. > - Or, take a look kernel config on v4.12 and v4.13-rc1 - maybe some new option breaks your system. Sorry to belabour the point, but how can I do this? I have a .config generated from the bisects but aside from deleting it and doing all the bisects over again I don't know how to see the changes. Surely there's an easier way? Try changing IRQ configs (CONFIG_GENERIC_IRQ_MIGRATION=y to =n) and i2c-designware's (CONFIG_I2C_DESIGNWARE_CORE=y to =m).